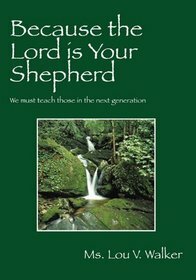 Because the Lord is Your Shepherd: We Must Teach Those in the Next Generation by Ms. Lou V. Walker speaks of knowing the Spiritual Living God. “You have misery and strife because you do not know the spiritual living God personally…” Ms. Walker illuminates that many are called to be children of Light, teaching and instructing one in knowing God’s promises for His children. She encourages all to come to God, personally, and to know the wonderful promises in the Holy Bible that God has left for His children-and your own future generation.